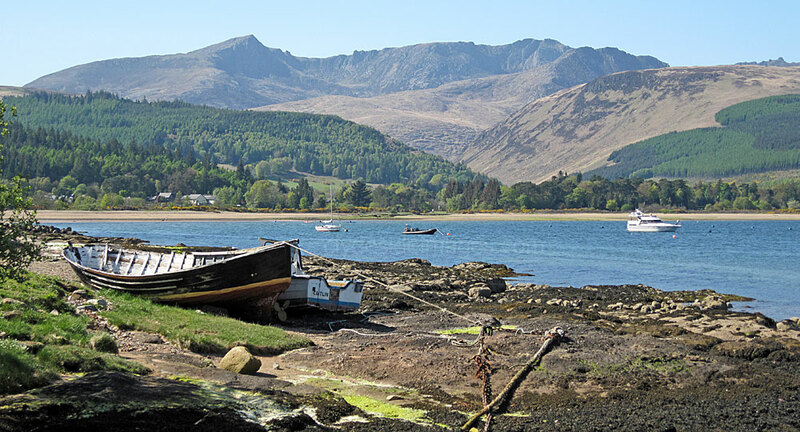 Arran`s Central Ridge from the shores of Brodick Bay. Despite bright conditions across southwest Scotland high winds failed to shift the persistent cloud clinging to Arran`s high tops until well after mid-day. I`d arrived on the first ferry and set off from Brodick at 8 a.m. Even with the tops obscured it was a pleasant walk-in through Glen Rosa where around a dozen tents had been pitched at the riverside campsite. After a couple of kilometres a steep path branches off and climbs beside the Garbh Allt burn which was in full flow after a spell of heavy rain. I thought I`d spotted my first Arran Adder here, coiled on the path, but it was a Slow Worm. I managed to get one blurred shot (previous page) before it disappeared into the heather. Beinn Nuis, the southernmost peak, was a washout in the view department. It wasn`t until I headed along to Beinn Tarsuinn that gaps opened up on the left, revealing lonely Glen Iorsa. Gradually cloud cleared from the neighbouring peaks including Goatfell. It was very bright to the north and it looked as if Bute had been basking in sunshine all morning. I took the easy option and bypassed the mile-long A`Chir Ridge on the left, then continued to Cir Mhor where I photographed a couple of Stags. A small herd waited nearby on the connecting ridge to Caisteal Abhail and kept a wary eye. I decided to leave `Abhail, the island`s northernmost Corbett, for another day and had a brief rest on Cir Mhor`s airy top before descending. A path into Glen Rosa lies to the south of Cir Mhor`s summit block but a steeper alternative leads directly down from the summit itself into Fionn Choire to reach the bealach known as the Saddle, which connects Cir Mhor and North Goatfell. I opted for this route and discovered that it was not as straightforward as it first appeared having a few short steep sections with limited foot placements. In his book, Climbing The Corbetts, Hamish Brown, the well-known author and mountaineer, recalls that on the descent from Cir Mhor into Fionn Choire he tied clothes together to make a rope, attached one end to his rucksack and stuck his wee dog Storm in it, lowering him to bypass a steep section. The wee dog wasn`t impressed and jumped out halfway down. He obviously thought it safer to have all four paws on the ground! From the Saddle, it`s an easy-angled walk down Glen Rosa, a pleasure compared with the initial steep descent from Cir Mhor. The sun had convinced a large group of teenagers camping near the road end that summer was finally here and they were clad in trunks and bikinis, taking turns at swimming in a deep pool of the Glenrosa Water. They wouldn`t last long if the wind dropped - with all that bare skin they`d be irresistible targets for the midges! I just managed to catch the 5.30pm ferry as it was running late and that saved me a wait of almost 90 minutes for the next and final ferry connection of the day. I looked back during the crossing and saw that the mountain tops were once again obscured by thick, low cloud. It was a very gloomy scene. Several rock formations reminiscent of sculpted heads can be found along the ridge.